Easter egg hunts are proof that your kids can find things when they really want to. Easter is just around the corner. Are you ready for it? It’s a fun time to get special pretty dresses and bow ties on and venture out into the warmer temperatures to hunt for the Easter Bunny’s hidden treasures! The cute photos captured during this time are timeless memories to last a lifetime. Step 1: Buy small items to fill their eggs instead of candy. Coins, stickers, Legos, tattoos, and little toy cars are a great alternative. Step 2: Buy a brushing buddy (stuffed animal or action figure) to accompany your children as they perform their essential daily oral habits of brushing and flossing. Step 3: Get your child a new toothbrush with a fun action figure or princess on it. Or, purchase a cute stool that will help your little ones reach the sink to rinse and spit on their own. Step 4: If you want to give candy, give dark chocolate for its health benefits. Step 5: To protect your children’s oral health, our doctors at Feather Touch Dental Care offer you preventive care such as sealants and fluoride treatments. Book your child’s preventive dental care appointment today with us at Feather Touch Dental Care. 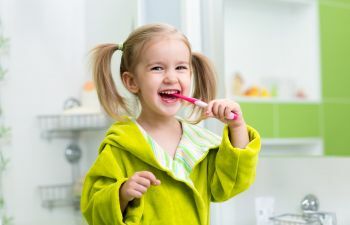 Additionally, our family-friendly staff will demonstrate proper brushing and flossing techniques to teach your children how to care for their teeth at home.